About 20 years ago we had the pleasure of visiting Central America on an extended vacation trip. We really enjoying visiting and touring many of the countries but sadly, we never had the chance to visit Guatemala or the Antiqua area. Recently I was emailed some information about the El Convento Boutique Hotel and wanted to share it with all of my travel blog readers who may be heading to the area on an upcoming vacation or business trip. 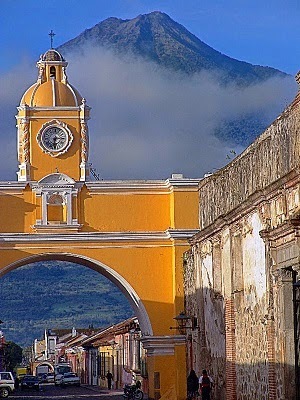 Antigua, Guatemala-El Convento Boutique Hotel opens its 26 spacious suites to welcome families to enjoy the UNSECO World Heritage city of Antigua, Guatemala. El Convento is an ideal base for families to explore the cultural, historical and natural wonders of one of the most popular destinations in Central America. Along with strolling along cobblestone streets and learning about the rich history of Antigua, there are many ways families can enjoy sun-filled days. * Tour the town's sweet spots. Antigua has many stops for families to learn the history of cacao and the cacao tree. Along with visiting an artisenal chocolate factory or partaking in a chocolate workshop, there are several places around town to satisfy your sweet tooth. * Meander through the cultural hot spots. Take a few hours to stroll around Antigua and see the major cultural highlights including the City Hall Palace, Palace of the Captain's General, the Cathedral with its majestic ruins and Paseo de los Museos. * Go on a knock knock treasure hunt. Stroll through the cobbelstoned streets and take note of the myriad door knockers throughout Antigua. Collect photos and memories of the many ways people decorate their doors in Antigua. * Become a bird watcher. Did you know that there are over 100 species of birds to be spotted in Antigua? Enjoy the splendor of nature while introducing your children to the joy of bird watching. * Embark on a spiritual tour. Antigua is one of the best conserved colonial cities with many religious edifices to behold. Take a day to see the many churches, convents and cathedrals including Santo Domingo convent, San Francisco convent, San Francisco Church, Nuestra Señora de Belén convent, Nuestra Señora de la Merced convent-church, Church and convent of La Compañía de Jesús:, San Juan de Dios convent, House of the Congregation of the Oratory of San Felipe de Neri, Church and convent of Las Capuchinas, Church and convent of Santa Clara, Church and convent of Nuestra Señora de la Merced and Church and convent La Recolección. * Visit a coffee plantation. Along with learning about the craft of roasting and pressing coffee, review the bean's history and delight in a coffee tasting. You can also enjoy zip lining over treetops and riding a mule through mountain trails. * Visit volcanoes. There are many volcanoes to visit in and around Antigua including Fuego and Acatenango, Volcán Pacaya and Volcán de Agua. A family trip is the ideal memory-making experience. * Bike around the city and stop at a macadamia farm for macadamia pancakes, visit a textile factory, market or artisan workshop. Short trips can also be arranged to area favorites including Monterrico beach, Atitlan Lake, Coban, Lanquin and Tikal. Families looking for an intimate boutique hotel can also check out El Convento's sister property, Lo de Bernal. The nine suite hotel offers Spanish Colonial style and charm and is located near Central Park and the bus station. For more information, visit elconventoantigua.com or lodebernal.com. Disclosure: I am sharing this info just as a courtesy to my travel blog readers. No compensation was received and I am not affiliated with El Convento Boutique Hotel in any way. The information contained within this post along with all photographs are copyright El Convento Boutique Hotel.